Tritium’s CAN-Ethernet bridge makes it easy to form a virtual link between physically separated CAN networks. The CAN/Ethernet network arrangement is extremely flexible – you can connect the bridge point to point, over a local network or even via the internet using a Virtual Private Network (VPN). 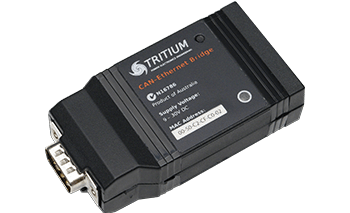 The CAN-Ethernet bridge is compatible with all Tritium products. The WaveSculptor22 motor drive is a high-efficiency, low-weight, three-phase 14kW variable frequency inverter especially designed to drive high-efficiency, low-inductance, permanent magnet motors. The WaveSculptor200 is an extremely reliable, powerful, lightweight and ultra-compact three-phase motor controller. It can drive an AC permanent magnet motor or AC induction motor with a peak power of 165kVA and an average of over 75kVA. Tritium’s CAN-Ethernet bridge allows easy access from a PC application to the vehicle CAN bus. It utilises multicast UDP/IP to communicate between PC applications and the bridge, which allows multiple PC applications to connect to the CAN bus at once using only one CAN-Ethernet bridge. As UDP/IP is built into any modern operating system, no special driver installation is required. The structure of the CAN/Ethernet network is extremely flexible. The bridge can be connected to the PC point to point, over a local network or even via the internet. With multiple bridges in use, it can be used to form a virtual link between two physically separated CAN networks. Shown below is an example network configuration using the Tritium CAN-Ethernet bridge. Windows C++ (MFC) interface library available upon request, please contact us for more details. The CAN-Ethernet bridge is priced at A$195 ex GST. Higher volume pricing is available upon request. We are currently accepting orders, shipping immediately. Australian residents please add 10% GST. It is a third generation product, with its predecessor, the WaveSculptor20, used by nearly all leading solar racing car teams worldwide, with an excellent reputation for reliability and performance. 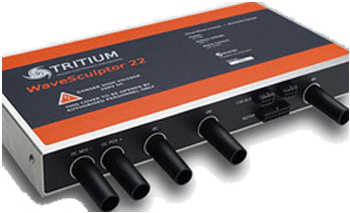 The WaveSculptor22 provides you with more flexibility and the potential to better integrate the controller into your vehicle. Any heat generated by the motor controller is extracted via a cold plate on the base, giving you the ability to optimise the cooling system for your particular vehicle. This gives you a wide range of options for cooling, from air or liquid, to using the vehicle itself as a heatsink. The suite of firmware, software and ancillary products that form the WaveSculptor drive system work seamlessly together to make the motor controller easy to configure, and compatible with a wide range of electric motors. The WaveSculptor22 is built using highly reliable, environmentally friendly lead-free SN100C® solder from Nihon Superior Co., Japan. The WaveSculptor22 is priced at A$6,000 ex GST. Higher volume pricing is available upon request. We are currently accepting orders, with an 8-week leadtime. Australian residents please add 10% GST. The WaveSculptor200 is an extremely reliable, powerful, light-weight and ultra-compact three phase motor controller. It can drive an AC permanent magnet motor or AC induction motor with a peak power of 165kVA and an average of over 75kVA. Wiring the WaveSculptor 200 into a vehicle is simple. Apart from the high power cabling, the WaveSculptor 200 only has a single connection to the vehicle — the CAN bus connector. The CAN bus is used to command the vehicle, broadcast telemetry, configure the controller and update the firmware. A powerful user interface makes configuring the controller simple. Tuning wizards, provided as part of the WaveSculptor software suite, tune the controller to the selected motor. This allows the WaveSculptor to be used with any number of different induction or permanent magnet motors. 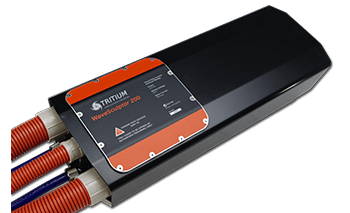 Having evolved from the high performance arena of solar car racing, the WaveSculptor200 is full of features not found on other motor controllers in the market. It controls motor current, vehicle speed, battery current, and reduces battery current flow to keep within the maximum and minimum pack voltage. By working in conjunction with our IQcell BMS it can do the same for the individual cells. The WaveSculptor200 is designed to be mounted under the vehicle’s bonnet and is therefore water and dust proof. All cooling is provided via a liquid cooling loop. The WaveSculptor200 is priced at A$6,000 ex GST. Higher volume pricing is available upon request. Please use the form below to get in contact with a member of our Tritium Racing Support team.